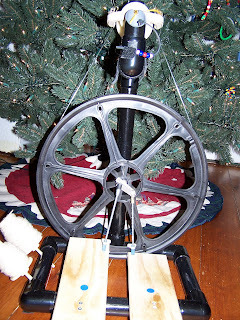 My WONDERFUL DH gave me a spinning wheel for Christmas!!!! I know it isn't Christmas yet but I couldn't leave it in the box! Anyone who knows me knows what a HUGE deal this is! 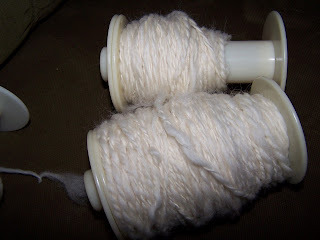 I have been spinning for a year now on a drop spindle. I LOVE spinning! I have been dreaming of someday having a wheel but I didn't think that would happen for a few years yet. Money has been tight in our house. My DH had to do a lot of careful planning to swing a wheel for me. I wanted the Babe wheel. WHY? Well 1st I am a thrifty person. I don't like to spend a lot of money on things unless I know it is what we need. I have been wondering what if I don't like spinning on a wheel? What if I can't learn to use a wheel? What if something breaks in our house (car, major appliance, or such) and the repairs cost a lot and because of a spinning wheel we can't afford to fix it. What if's like that kept me from wanting a nice wooden spinning wheel. I live WAY out in the country. I can't go to a shop and take spinning lessons. I knew that if I ever got a wheel it would have to be something I could learn on my own. I LOVE this wheel!!!!! I am in heaven!!! I feel like a child who pictured something in her dreams and all the sudden it became REAL! First when I opened the box I was all excited!!! THEN came the instructions....... I must say that this is the DOWN side of getting a Babe wheel! The instructions I felt are POORLY written!!! The illustration is AWLFUL! GOOD side is that it is such a simple wheel that even for me (a person who has NEVER used a wheel) It could be put together. My WONDERFUL DH did help me put it together. It was quick (could have been quicker if we had better instructions and pictures. This is something a spinner will find funny! I don't know how to knit yet. I have a sweater machine that knits for me. I can knit in minutes on this machine what takes my MIL days to do. I thought that going from my spindle to a wheel would be the same. BOY was I wrong! I can spin faster on the wheel but not at the speed I pictured! SO if someone is thinking about getting a wheel and you think you are going to spin up HUGE amounts of yarn in a few minutes time..... Ummmm... I don't think you will do that. If you use a dropspindle and you would like to save the time you spend winding on you will be able to do that once you get your wheel spinning. This wheel is EASY to pick up and move! My 1 year old is in love with yarn. When I need to leave the room she will walk over to the wheel and start undoing my yarn. This Babe wheel is so small and light I can pick it up and put it in a place my DD can't get to. If I had a wooden wheel I know it wouldn't be that easy to do such a thing! I like that this wheel doesn't have a lot of parts and that I will be able to teach my children how to spin on it and not be afraid that they will do harm to it. $226 so it was a lot higher in price. I didn't know that a single treadle could get going by giving the wheel a bit of a turn with your hand. I am VERY happy with the wheel I got. The black looks nicer in my opinion. The double treadle was easy to get going. I do feel that I "could" have been happy with the pinkie wheel and that would have cost less money. (above) This is my first yarn on my wheel. I have to say that I am VERY surprised that it looks like my first yarn on the spindle. I guess I thought that with my year of experience on the spindle that my first yarn on a wheel would look more even. LOL! I didn't ply it I am not sure what to do with it. LOL! 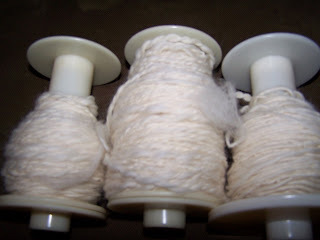 (Below) is a picture of my 3 bobbins done after I made the yarn above. I didn't ply the stuff in the above picture. 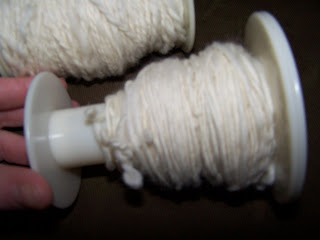 This is my 2 spools of yarn I have finished 2 ply. I must admit that I LOVE the uneven look yet at the same time I want to spin more even yarn. 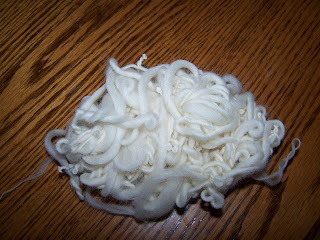 This is the single I have left over because my spools didn't have the same amout of yarn on them. I will get online later to read email and post some more pictures of my wheel for anyone who is wondering what kind of things I was confused with. Right now my children are taking a nap and my new wheel is calling my name! Hello, all is going perfectly here and ofcourse every one is sharing data, that's actually good, keep up writing. this informative article about the best way to make money on Ebay Donnie has many years of work experience like a writer as well as working with drop shippers in a variety of entrepreneurial ventures.